I recently took apart 2 DVD readers? Might have been burners too, but my question is why can't I see the lasers? I tried using both 2 and 4 AA batteries hooked up according to this diagram http://d13z1xw8270sfc.cloudfront.net/origin/58770/diode_wiring_diagram.jpg . I can feel the diode heating up after about 5 seconds, but I can't see the actual laser. Thanks for the help. I don't have the rep to comment, but it sounds like the answer to your question is that the diode may be working and you can't see the light because infrared is outside of the visible spectrum. There are lasers with all kinds of wavelengths. Only a small part of the EM (electromagnetic) spectrum is visible light. So it's possible it is in the infra red range. You can often see IR light with a digital camera. Also never look directly into the laser also invisible light can burn or harm your eyes. Not the answer you're looking for? Browse other questions tagged laser-diode or ask your own question. Building a laser driver circuit? 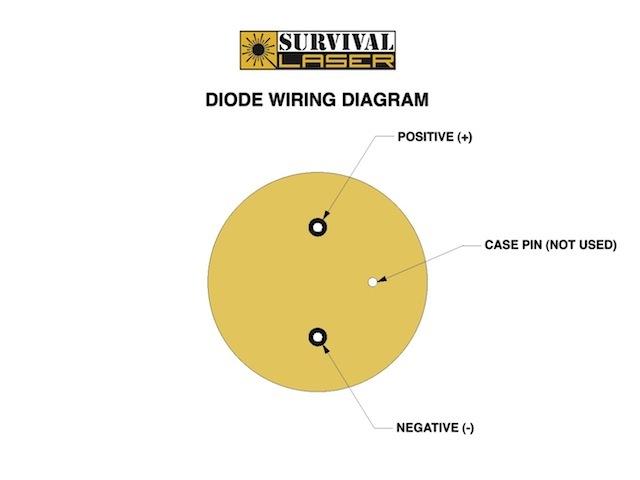 Running Laser Diode without a driver? Why do laser diodes need temperature controllers? Why not just cool them? Max current for 5ns pulsed CW laser diode?